WhatsApp now has a web interface, which you can use on all mobile devices except for iPhone. So if you have an Android device or Windows Phone, check out web.whatsapp.com first as it may save you a lot of hassle! If you're on an iPhone however, please read on.. I implemented a nice way of using WhatsApp on my laptop and also staying in sync with WhatsApp on my iPhone. This will work with Android too (but you may prefer to use web.whatsapp.com instead). You must have a second SIM card (i.e. a second working mobile phone) that is not already being used for WhatsApp. E.g. an old prepaid phone. As long as it has a working SIM card and you are able to receive an SMS message on it. A free program for your computer called BlueStacks, which you can get for PC or Mac at http://www.bluestacks.com. Alternatives to BlueStacks are: AndY (free! ); AMIDuOS ($10). Note AMIDuOS seems to have a reputation as a very accurate Android emulator and has a free 30-day trial. AndY is recommended above Bluestacks HERE, but I have no personal experience with AndY. Download and install BlueStacks. Bluestacks is like a virtual Android phone that you can run on your computer. When you want to start a new WhatsApp chat, choose the option to create a Group Chat and add your other account (the new one you just created) to the chat. Then add the person you want to chat with to the group chat and you're away. Now you can send messages from either your phone or your computer. Obviously the person you're chatting with will see it's a group chat with two people, so make sure the user name you pick clearly shows it's you! Maybe add the word "work" to one of them so they see it's your work account. Or add "mobile" to one and "home" to the other. Start the Group Chat on your main phone, not on your computer (BlueStacks). This way you keep control of the chat from your main mobile phone and can add/remove other chat members or end the chat most easily. Then you only need 1 phone (1 SIM card) and the web app is so good, you can just use your phone's native browser! Great idea! And now a days it is common to have multiple number. i want to install on mobile and on laptop also, will it work together. You need to have 2 mobile phone numbers for this to work. 1 mobile phone number is for your normal mobile phone and you set up a Whatsapp account as normal. 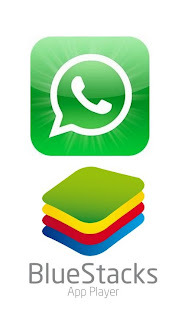 The 2nd mobile phone number is for setting up Whatsapp on Bluestacks. So yes, you have to have 2 separate Whatsapp accounts. Just tell your friends you have 2 accounts, no big deal! I use 2 accounts anyway because I have one phone for home use and one for work, so having more than 1 Whatsapp account really is no big deal. As I explain above, you then need to simply set up a group chat and make sure both your accounts are participating in the same group chat. but is it posible to sync them? I installed the whatsapp on my pc but i didnt know I had to have two phones so now my whatsapp no longer works on my phone. Anonymous, just set up Whatsapp on your phone again and everything will be back to normal on your phone. I only have one mobile number. My phone was out of order for a couple of days & so i installed Blustacks & whatsapp on my PC (Windows 7) with my existing mobile number. I've got a new phone now but will be using the existing number. Kindly advice as to how do i get rid of BlueStacks/Google Play/WhatsApp frm my PC...as I am not able to download WhatsApp on my new phone now. Ur help will be much appreciated! Thanks!!! Hi Priya, all you need to do to activate Whatsapp on your phone again is install Whatsapp on your phone and register again with your phone number. Basically whenever you go to any device and register Whasapp with a mobile phone number that you have already used previously, your Whatsapp account will simply be transferred to that device (even if it's a device you used previously). I advise you therefore to simply start up Whatsapp on your mobile phone and register with your mobile phone number. how to delete whatsapp chat on my phone by some other way, not by phone? I am using whatsapp on my Anriod phone. Would it be possible to istall WhatsApp on Laptop also with same number. Does both (laptop & phone) WhatsApp will work at same time? You said "Be aware that if someone else signs up for WhatsApp with that same phone number later on, it will disable your new account." Would there be the possibility that the person can read old messages in my chat groups? @akshay, I don't really understand your question. But.. you can't delete chat messages from Whatsapp on your phone, except via the phone itself. I.e. you can't delete chat msgs from the phone remotely. E.g. another participant of a group chat cannot delete messages on your phone. @paramesh, you just install Whatsapp on your iphone. Then start a group chat and include your 2nd phone number (the one used in BlueStacks) in the group. Please read the post again and tell me what's unclear. @Anon1, as stated in the post, you need 2 phone numbers. This technique can't be used with one phone number. it means only one number can work on 1 device only i;e either on Laptop or on mobile phone right? @Ahmed, yes correct. If you try to use the same number on a 2nd device, Whatsapp will basically transfer your account to the 2nd device. That's why this only works with 2 phone numbers.